Ah, the early 60s. A time before the sexual revolution, still resting in a world of post-war fears and communism. A world of the perfect housewife who had long-forgotten the freedoms from the second World War. And in the new Dark Horse comic, Lady Killer, it is also a world where a woman assassin would also make the perfect wife. Meet Josie Schuller, assassin. She kills Russian spies and still makes time to put dinner on the table. Frequent collaborators Joëlle Jones (known best for her work on the supernatural viking story Helheim) and co-writer Jamie S. Rich have created a main character that somehow has forged a balance between the familiar stereotype of a house-bound wife and a woman liberated through a secret. 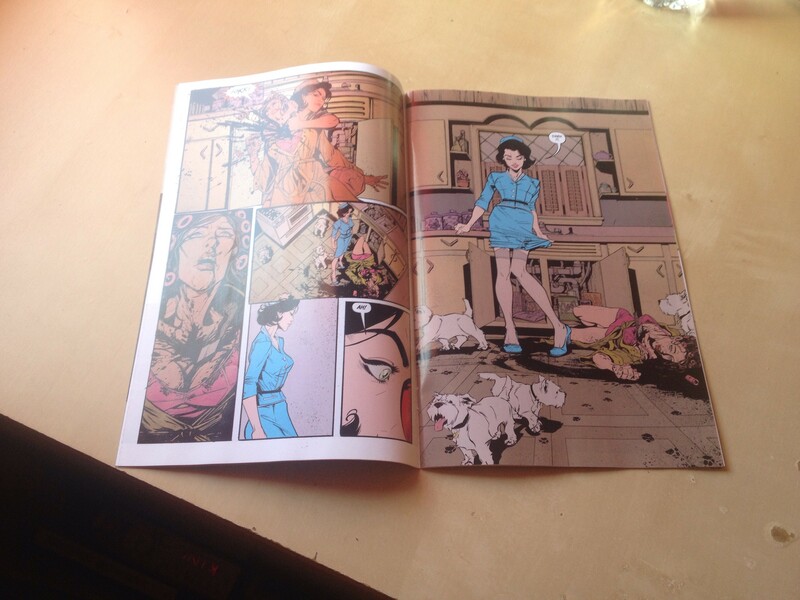 Unfortunately, it seems as though Lady Killer will only be running for five issues at the moment. This is especially disappointing considering issue #1 doesn’t seem to give much away in means of plot-line. This makes it both intriguing, but with plenty to be wishing for. Instead, readers are given a brief introduction to Josie and her double-life. The story opens with her visit as an Avon Lady to the house of a Ms Roman. Mr Roman, or Romanov, is a spy and the next target of Josie. The dramatic angles of the art and funny quips make it quite the opening scene. That’s not to say that the home-life of our assassin isn’t also intriguing. She lives with her husband and two daughters and her intolerable German mother-in-law. The contrast between the two worlds also makes a subtle political statement, begging to ask the question what it meant to truly have the American Dream. Is it really all it seems to be? The story is a fun rump that is just as the tagline promises, “Betty Draper meets Hannibal!” The plot remains to be smart while also giving the readers plenty of gore. It will be interesting to see how much of Josie’s life will be shown to the readers in this first arc. The first issue has certainly given a taste that makes the story intriguing. The story is plenty of fun, hopefully more of the story arc is to come in the future. It seems as though Dark Horse will be behind the project if it does well enough. Josie is a heroine just too cool not to explore further – she’s one heck of a killer. Joelle Jones has fantastic faux-ads that tie in with the comics. They are hilarious and totally worth checking out. You can find them here and in this interview with the two writers.